Flor de arena is used in purifying/cleansing treatment, and in various disorders; digestive system disorder, urinary system disorder, nervous system disorder. It eliminates uric acid found in the blood and in the connective tissue. 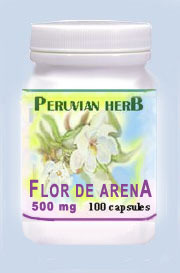 Flor de Arena eliminates successfully sciatic pain. Alleviates rheumatic pain. In the most often recommended - six-week purifying course of treatment - Flor de Arena is used for two weeks directly after Manayupa and before Hercampuri. It leaves the body free of contaminants and toxins coming from preserved foods, an excess of spices or the consumption of red meat. Due to its detoxifying action, it regulates and improves kidneys and nervous system function. Boil 1 liter of spring or distilled water. Pour a shallow tea spoon (~3.5 grams) of herb into the boiling water and let it boil on a very low heat for 5 to 8 minutes. Pour everything into a thermos, put a lid on (tide it) and leave it overnight. In the morning strain /drain it and drink the complete liter dividing it in 3 or 4 equal portions, drink each portion 1 hour before or 1 hour after meal (on empty stomach) 3 or 4 times per day.